WM Engineering Work is a construction equipment supplier company. Our company is located in Kawasan Perindustrian Taman Berjaya, Johor Bahru (JB), Johor. We are in the engineering industries for more than 20 year experiences. We supply products such as excavator, construction equipment sales, rental & service, machinery sales & rental, soil, sand, stone & infra works and earth work construction. With the successful sales we had made, the company had grown bigger and start to implementation of training for servicing team. We are a professional company with a strong passion in earth work construction, and have flair in designing various customized solutions and attachments for the construction and marine industries. 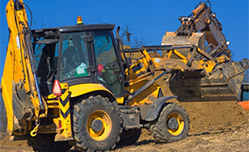 We provide sales, rental, and service for all type of used/ new construction equipment and machinery for company.